Known as the Kingdom Of Wonder, and home to the remarkable Angkor Wat temples, Cambodia is still recovering from a turbulent recent history. In Cambodia, while three quarters of the population live in rural areas, only 300,000 Cambodians have a bank account. 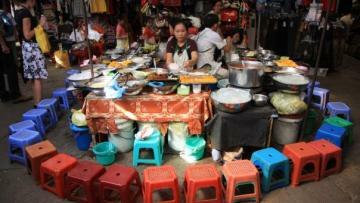 The country of the Khmers, with 15 million inhabitants, 30% of the population is poor. 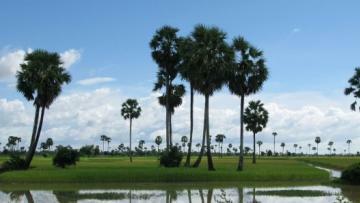 Rice is cultivated primarily through traditional farming practices by over 80 percent of Cambodian farmers. It is the staple food of Cambodians and is their most important field crop. 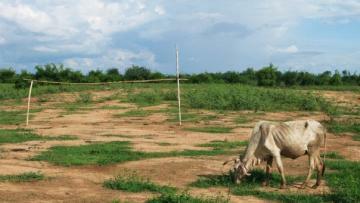 Rice is mainly produced during the wet season, but dry season harvests are an increasing component. Yield has increased from year to year, thanks to access to better fertilizers and other inputs. A country with both a rich ancient history, and a tragic recent history, Cambodia is one of the poorest countries in the world, yet its 14.9 million inhabitants (UN, 2009) remain focused and optimistic about the future. Covering an area of 181,035 square kilometres, about half the size of Germany, and bordered by Vietnam, Laos, and Thailand, Cambodia is mostly made up of low, flat plains that provide ample space for its large agricultural sector, an industry reliant upon the waters of the Tonle Sap (great lake) and Mekong River. Wat, the world’s largest pre-industrial settlement complex, draws millions of tourists each year. Between 1975 and 1979, Cambodia was ruled by the radical Khmer Rouge party, founded by their infamous leader, Pol Pot. It is estimated that during this brutal regime, up to 2 million Cambodian people died from exhaustion, starvation, or from being tortured and executed. Today, still healing from the scars of this devastating legacy, the Cambodian people are dedicated to education, with consistently high levels of school and university enrolment. Cambodians enjoy relative freedom of speech and access to information. Many visitors to Cambodia find themselves charmed by the warm, peaceful, often shy, and unfailingly polite Cambodian people. Rice farmers are thought to have first arrived in Cambodia in around 3000 B.C. The rice industry still thrives as a major source of income for many Cambodians. 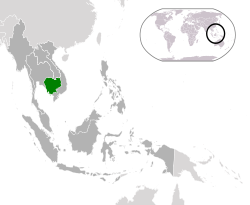 Mainly consisting of ethnic Khmers, Cambodia also absorbed influences from India and China, many of which they passed on to neighbouring civilisations that have since become Thailand, Vietnam, and Laos. 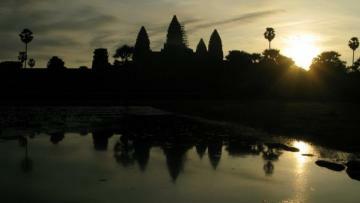 Between the 9th and 13th centuries, the Khmer Empire flourished throughout south-east Asia, with Angkor Wat as its centre of power. Following the introduction of Theravada Buddhism in the 13th century, the empire began to diminish in influence, and was eventually overthrown by the Ayutthaya Kingdom in the 15th century. In 1863, the then-King Norodom sought the protection of the French from the Thai and Vietnamese as relations grew tense between them. Cambodia continued as part of the French Indochina colony until 1953, when, under King Norodom Sihanouk, Cambodia gained independence from France. In 1975, after the devastating effects of both US and Vietnamese bombings of Cambodia during the Vietnam War between 1969 and 1973, Cambodia was facing a potential famine situation, with rice crops and animals greatly diminished. The Khmer Rouge, a radical group, seized this opportunity to take power, evacuating cities and sending the entire population to perform hard-labour in the countryside. In an attempt to achieve an agrarian utopia modelled on the 11th century, the Khmer Rouge rejected religion, western medicine, and destroyed temples and libraries, as well as executing anyone deemed as intellectual including doctors, lawyers and teachers. The brutal regime bore a terrible cost, with up to two-million people dying from starvation, disease, overwork, and execution. The Khmer Rouge was finally overthrown in 1979 by invading Vietnamese troops, but the party continued to remain active to a lesser extent throughout the 1980s. The 1980s Hollywood film The Killing Fields brought the stark reality of the situation into the global spotlight, shocking audiences with its depictions of the suffering endured. Recently, reconstruction efforts aided by a number of developed nations, and restoration of a stable government and the rule of King Norodom Sihanouk, have enabled Cambodia to enjoy a period of recovery and growth. Growth has accelerated over the past decade thanks to garment exports to the USA and Europe, a tourism boom, and strong agricultural production. The global financial crisis impacted tourism and exports and reduced foreign direct investment levels, causing a slowdown in growth and a contraction in the economy in 2009. The country is emerging from the financial crisis, and economic growth is expected to be 4% in 2010. The main religion in Cambodia is Buddhism, accounting for 96% of the population, with other cultural influences including French colonialism, Angkorian culture, and modern globalisation. 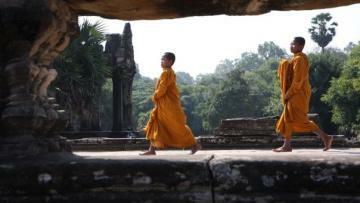 Khmer culture has distinctive styles of dance, architecture, and sculpture, many of which have been shared with neighbouring Thailand and Laos throughout history. Cambodian food is based on a staple of rice and noodles, with fish from the Tonle Sap and Mekong providing the majority of their protein needs. Tropical fruits and soups are also eaten. Cambodian cuisine, although less-known than Thai and Vietnamese cuisine, is said to have heavily influenced the cuisine of the entire region. Sport is popular in Cambodia, with badminton and sey, a form of hacky sack, familiar sights in public parks. Soccer and snooker are also popular. Many Cambodians take daily walks to keep fit – the heat makes jogging impractical – and group dance classes in public parks are regular occurrences. One of the most popular pastimes in Cambodia is learning. School attendance is higher than in many comparable countries, and Cambodians commonly seek university degrees and post-graduate education. It is normal to see security guards studying by the light of a flickering street-lamp, or hear motorbike taxi drivers talking about their part-time university studies. Cambodia has a well-developed microfinance sector thanks to a favourable regulatory environment, the shallow reach of traditional banks, and strong economic growth over the past decade. The Cambodian Microfinance Association reported in September 2010 that its members cover all 24 provinces with over 1.2 million borrowers and a gross loan portfolio of almost USD 530 million. However there is still room to grow, as a large proportion of the population still lacks access to financial services. The recognition by both the government and National Bank of Cambodia of the importance of microfinance in expanding economic opportunities has created a relatively transparent and responsible market, and one that is likely to continue to set trends for the global microfinance industry. a. The de facto currency is the United States dollar. SAMIC is a licensed MFI that serves over 16,500 clients in urban and rural areas through both group and individual loan products, as well as being one of the few MFIs to offer microinsurance. Started as the credit programme of health NGO, SAMIC became a separate organization in 2005. With a committed staff of 171, strong shareholders, and an experienced management team, SAMIC is aiming to expand its reach to new clients and further its vision of improving the living conditions of the poor in Cambodia. To contribute to poverty reduction and therefore improve the living conditions of the Cambodian poor and support them in their ongoing progression. SAMIC, formerly known as Cambodian Health Committee (CHC) which created in March 1994 for responding to the public health problems in Cambodia , especially tuberculosis and AIDS among rural poor people in the Svay Reang province. In October 1994, CHC began implementing a rural credit program as part of an approach to reduce tuberculosis prevalence by reducing poverty. In 2005, CHC NGO was transformed into a private company, receiving its license as a limited company from Ministry of Commerce, and on the 14th of September the same year, was granted its MFI license from National Bank of Cambodia. 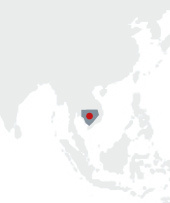 2006 to 2008 CHC Limited expanded its operation to the Presihanouk, Kandal, Siem Reap, and Kep provinces. During this period, CHC Limited strengthened its internal management structure, and established department heads and a board committee. CHC limited received its permanent MFI license from National Bank of Cambodia in 2008. 2009 to 2010 CHC Limited further expanded its operations within its existing provinces, and expanded into Kampong Speu province. It also officially changed its name to SAMIC Limited. SAMIC was established with vision of contributing to poverty reduction and the mission of providing financial services to poor Cambodians living in rural and urban areas. The majority of targeted clients are poor people who live in rural or urban areas, particularly women. SAMIC serves more than 16,500 clients, in turn benefits an estimated 55 000 people within local communities, and has a gross loan portfolio more than 9 million USD. The majority of clients are women living in rural areas and working in the agriculture and trade sectors. SAMIC operates in the capital city, Phnom Penh, and 6 provinces, totaling 882 villages within Cambodia, and operating through a system of provincial branches and sub-branches. Four loan products have been introduced to meet the needs of the clients: Individual loans, Group Solidarity Loans, Village Bank Loans, and Emergency Loans. The Group Solidarity and Village Bank Loan are designed for poor people with daily, weekly, monthly, or seasonal income. Loan sizes are small and the clients form solidarity groups to reduce risk to the MFI. The Individual Loan aims to serve clients who require larger loan amounts and long terms. The special Emergency Loan is targeted at clients who suffer any difficulties in their business because of natural disasters or any unexpected accidents. SAMIC is also planning to launch SME loans to service the clients that have grown their business to a certain size. Currently SAMIC has a dedicated staff of 181, of which 66 are credit officers (COs). All staff of SAMIC follow closely the six core values of SAMIC: humanity, creativity, responsibility, dependability, honesty, and service to the people. Strong human resources is an important factor for creating competitive advantage. SAMIC carefully sets the human resource strategy, to motivate, and maintain the key staff competences. Every year, SAMIC presents a certificate and letter of appreciation to those who have excelled in their role, and offers clear and achievable promotion paths. In addition, regular training is provided to ensure the staff maintains its knowledge and skills.